My friend Suzanne is a volunteer for the City Animal Shelter, and very involved with animal rescue throughout the area. Occasionally, she spends a day at the K9 Connection training center with me, to observe my work and take anything she can learn back to the shelter to help the animals. Being active in the community, she is also friends with other trainers, including some who have been my critics throughout the years. I am what many would call a Balanced Trainer. I believe that the dogs are best served from a training approach that utilizes both reward and consequence to give them the maximum amount of feedback on their behavior possible. There are many trainers these days who disagree with that approach and prefer to train using only rewards (and the consequence of no-reward) to train dogs. I respect these other trainers for what they do, and I respect their opinions, but based on my experience I cannot abandon my conviction that dogs, like humans, thrive on balance. I understand that there may be some situations where dogs need to be corrected, but I am going to try very hard (and spend a lot of time) first to solve the problem with rewards based training, before going that rout. My last post discussed some points about ethics in dog training and some research which showed that reward based training isn’t necessarily less stressful for a dog than a well timed correction. This comment from her friend brought up another important discussion about ethics which I shared with Suzanne. Again, the trainer here is drawing on the assumption that solving a dog’s behavior issue with rewards only will always to be inherently more humane/ethical, than using reward and correction combined. When dogs are brought to a trainer due to behavior problems, those problems are typically having a ripple effect on both the dogs’, and the humans’ lives. Secondly, often due to behavior problems, the dog’s life has become limited. Limited freedom, limited exercise, and limited socialization. Again, this is not a healthy condition or way of life. Third, these problems typically place a strain on the relationship between human and dog. Frustration, anger, and anxiety can drive a wedge between them. As inherently social creatures, I cannot help but believe that the dogs’ are negatively impacted by this social strain. Fourth, let us not as professionals forget to take the stress and well being of the human into account. Humans are animals too, and as professional trainers we have an obligation to help the dog and human reach a better quality of life as quickly and effectively as possible. Fifth, the reality is that we are dealing with families who often have limited time, limited patience (usually their patience is already fading by the time they call me), limited training/handling skill, and limited finances (the longer it takes me to solve the problem the more it will cost them). The unfortunate truth is that the more time it takes us to correct the problem, the more likely the family is to run out of money, or patience, and give up on the dog. A truly sad state of affairs for the dog. I feel I have an ethical obligation not allow any of these reasons to continue any longer than necessary. 2) Try to solve the problem using only rewards, no matter what it takes. Limiting the sources of feedback I am giving to the dog, and potentially spending a great deal of time (and the clients money) resolving the issue. In my opinion, the clear choice is option #1. If I were to select option #2, I would be allowing the dog and the human to exist in a perpetual state of stress, far longer than is necessary; Costing the human more than necessary, and taking a significant risk that the goals will not be met before the human gives up (sometime because they have no choice). You see, as professionals, we have far more to consider from an ethical standpoint than whether or not it is technically or theoretically possible to resolve a behavior issue with rewards only. We must also consider whether is realistic and possible for the family we are working with, and the potential consequences of our failure, or at least, lack of a timely solution. This was the basis of the conversation (it was probably more like a lecture) that I had with Suzanne. Suzanne shook her head in disbelief. Then, the second event occurred, my next client walked in. it was a first session with a young couple, Kelly and Mike, who were referred to me by their veterinarian. They own two female pit bulls, who were utterly out of control, and had begun getting into very serious fights with each other. The fights were serious enough to cause injuries that required veterinary attention. Another issue to consider, the behavior is dangerous. I have got to get a handle on these dogs as quickly as possible for safety reasons. In the waiting room, the dogs were exhibiting what the owners described as their usual behavior. They were sitting separated from each other (to prevent fighting), and were hyper, anxious, stressed, and pulling on the ends of their leashes (gasping for air). Their feet were clenched and nails were sliding across the floor as the dogs tried desperately to pull towards me, towards each other, towards Suzanne, towards everything. It was all that Kelly and Mike could do to hang on. The dogs simply could not even go out into the world without being under an extreme amount of stress and anxiety. They could not go for walks together because it is when under this kind of stress that they are getting into fights. The other thing causing fights between them are resources, such as food. I fitted the collars, and with each dog separately, introduced them to my trademark system of conversational leash work. My system does not involve any harsh or painful corrections. The leash and collar are used with a subtle pressure/release, correction/reinforcement to teach the dogs the boundaries and expectations of the exercise, in this case heeling. By keeping the leash work simple I was able to focus more of my time teaching Kelly and Mike how their energy, focus, and body language were affecting the dogs. My goal is to affect their entire way of being with their dogs, so they can be in a better position to influence the dogs’ choices. Within less than a half hour we had both dogs outside, walking perfectly calmly at each owners’ side on busy Niagara Street. Then the big moment happened. I took the leash from Mike, and put it in Kelly’s free hand. 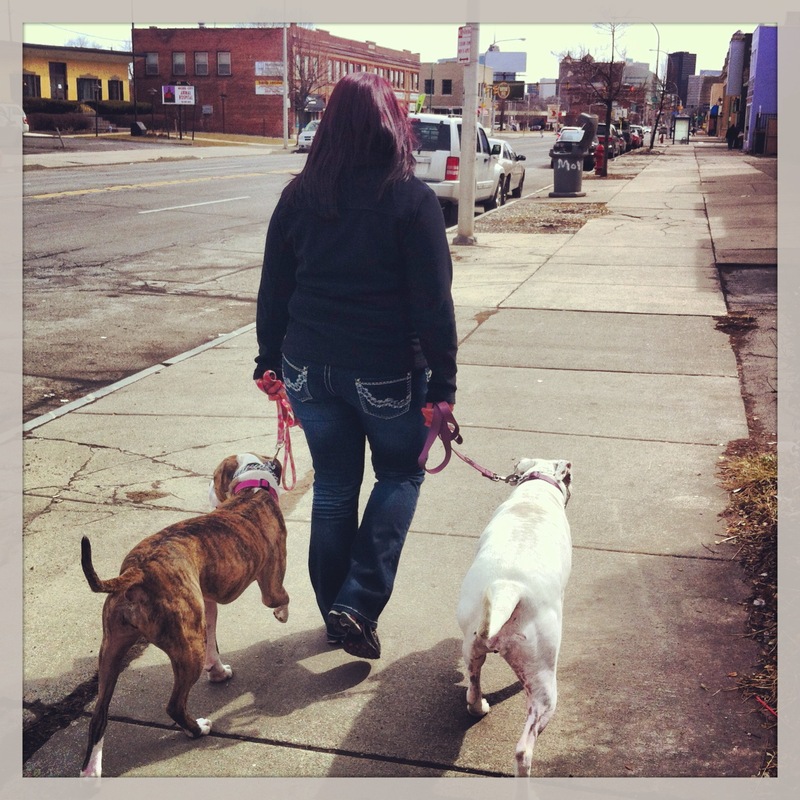 For the first time ever, she was walking both her dogs together, on loose leashes. A man on a bicycle passed, she was in disbelief. Normally, she explained, bicycles would set the dogs off. We returned to the office, and the dogs were perfectly calm and relaxed. Their stress was gone. The humans had taken control, and the dogs accepted the new limits on their energy and behavior gracefully and without protest. The humans were more calm too, and expressed that they felt empowered and encouraged. They all left in a happy, calm and confident state, eager to continue our training the next week. Here we go again, I have a duty to give it everything I’ve got. And I will.